Stay safe. No matter how simple or severe a storm may seem, it's important to contact a professional for repairs. By Karmen & Lisa K.
"I was most satisfied that Trinity Exteriors was fast and professional." Many of us have had first-hand experiences with the powerful and destructive forces of weather. In Minneapolis, we are faced with extreme weather year-round. 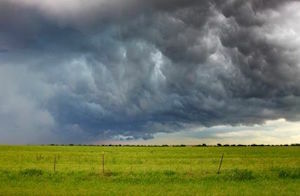 Heavy rains, hail, high winds, and tornadoes in the spring to ice, snow and sub-zero temperatures into the winter months. Although your home’s exterior is meant to protect you from the forces of nature, these extreme weather conditions can damage roofing and siding. When severe enough, anyone can see the toll that a high wind or heavy hail storm can take on a home. However, most often it can take a trained eye to spot the hidden damage that can compromise the integrity and lifespan of your roof, siding, and general exterior. Trinity Exteriors, Inc's representatives will bring any damage to your attention, give you an assessment of the severity, and educate you on beginning the insurance restoration process. If you're in need of storm damage repair, contact Trinity Exteriors, Inc today for a storm restoration cost estimate! We serve customers in Minneapolis, St. Paul, Eden Prairie, and throughout the nearby areas in Greater Twin Cities Metro Area. Get a Storm Restoration Inspection! On the beautiful St. Croix is West Lakeland. This little township was part of the large swath of the state affected by big storms in June 2017. But with a new Tamko Heritage roof in Autumn Brown, you might never guess this house was part of that mess. It will continue to look beautiful for the next couple of decades, barring any more weather events! The point where a restoration project can go wrong is the point when the homeowner chooses the wrong contractor. These Eagan homeowners knew they needed to choose an insurance restoration contractor who was local, with a great reputation. They found Trinity Exteriors, an award-winning contractor, based in Eden Prairie, MN. Our restoration consultant answered all the homeowners' questions about the different steps of the process, and helped them select the best products for their home. Our crews took a day to install the new Tamko Heritage 30 shingles in Harvest Gold. We cut in additional vents to increase the efficiency of the home's ventilation. Finally, because this part of Eagan is an established neighborhood with matured trees, we installed gutter guards to keep organic debris from clogging the gutters. There's nothing new about a Minneapolis area roof getting replaced after a hail storm. But this Eagan home's roof was 15 years old, and this replacement was a new experience for the homeowner. Homeowners can be intimidated by large, infrequent purchases, and that's why the Trinity Exteriors crew excels at creating a comfortable, easy experience for the storm restoration process. From the initial free, no-obligation inspection, to talking through the process step-by-step, finally to the end result installation, our storm consultant and production team took care of these homeowners every step of the way. We replaced the old, damaged shingles with new Tamko Heritage Woodgate in Black Sage. It looks lovely, don't you agree? The key to a beautifully restored home after a hail storm is working with a contractor you trust, one who has the experience to deliver exceptional craftsmanship. With more than a decade of experience in the roofing and siding industry, Trinity Exteriors works with the best products on the market, and offers unparalleled customer service. For these homeowners in Eagan, our biggest challenge was to match the siding the insurance company was willing to cover to the pre-existing siding on the house. Our restoration consultants found a nearly identical match, so the home would look uniform. Our crews removed the hail damaged asphalt shingles and replaced them with new Owens Corning Duration in Driftwood roof. The finishing touch was the new gutter system—seamless aluminum in white. After a weather event that affects their housing, homeowners should always review their insurance policy to refresh themselves on what is covered, and any stipulations. This homeowner in Hugo knew they had a limited window within which to get their roof replaced and have the work covered by insurance. Trinity Exteriors worked with the homeowner's timeline to replace the storm damaged roof with Owens Corning Duration in Driftwood, and install new Mastic vinyl siding in Pebblestone Clay. Despite some weather delays, the installation of this new Owens Corning Duration Premium Designer roof in Sand Dune went off without a hitch. The homeowners were happy with the ease of the restoration process, and they love their new roof! With their insurance claim already approved, these homeowners requested Trinity Exteriors provide an independent inspection and estimate for a damaged roof. Our Restoration Consultant agreed with the scope of the work from the insurance adjuster, which meant Trinity crews could start restoring the home to pre-storm conditions. The homeowners picked out Owens Corning Oakridge shingles in Aged Cedar for the replacement roofing. While hail storms can be destructive and cause hassles for homeowners, they do sometimes provide the opportunity for residents to check in with their home to make sure every thing is in working order. In this case, the free storm inspection by a Trinity Exteriors rep showed the decking of both the house and garage roofs was no longer in compliance with code. Tearing off the old shingles to install new Tamko Heritage 30 in Rustic Redwood gave the crews the opportunity to re-deck those structures and preserve the integrity of the new roofing systems. Hail and strong winds damaged this roof in Bloomington, Minnesota. Trinity Exteriors came out for a free inspection and to document the severity of damage for the homeowners' insurance company. After they worked through the claims process, the homeowners selected Owens Corning Duration in Brownwood, which Trinity crews installed within a day. Discuss any damage found during the inspection and your options to pursue restoration. Educate you on the insurance claims process and storm restoration construction. Meet with you and your insurance adjuster to ensure that you receive a thorough and fair assessment of your property. Guide you through the claims and construction process for your home or business, until it is brought back to its original condition. Offer tarp protection, downed tree clearing, temporary roof repair, reconstruction, and more. When a storm hits, it's imperative to move quickly and get a qualified contractor to determine how much damage was caused by hail or wind and estimate the cost of repairs. If you need emergency repairs to your roofing or siding, Trinity Exteriors, Inc is prepared and waiting to respond rapidly to your needs. We offer immediate emergency services in Greater Twin Cities Metro Area, covering Minneapolis, St. Paul, Eden Prairie and nearby. Get your home and your lives back to normal quickly following a natural disaster. Contact Trinity Exteriors, Inc for complete storm restoration services, including wind damage restoration and more. We provide fast, written estimates for storm damage repair in Burnsville, Minnetonka, Cottage Grove, Inver Grove Heights, Savage, Chanhassen, Rosemount and nearby areas throughout Greater Twin Cities Metro Area and many other parts of Minnesota. Our specialists can be reached by phone at 1-855-573-1653 or get an online quote to learn more about how we can help!